A week ago, everyone was predicting rain in Seattle (shocked?) and riders and teams were greeted with plenty of it as they rolled into town. But by Saturday, the sun actually came out, and not a drop of precipitation hit the ground. The Dirt Wurx crew had actually sent personnel in early to get a jump on the track, and the course was complete by Tuesday and covered before the big rains came in. The jumps were built to be a little less steep that usual to prevent them from getting cupped out at badly. Track builders also saved an extra pile of dirt and kept it covered, as well, and then added it to the track. The Saturday morning free practice sessions were cancelled, but both timed practice sessions ran as usual. Despite all the hard work, the track was still very tough—Eli Tomac said it was tougher than the mud race he won in San Diego earlier in the year. 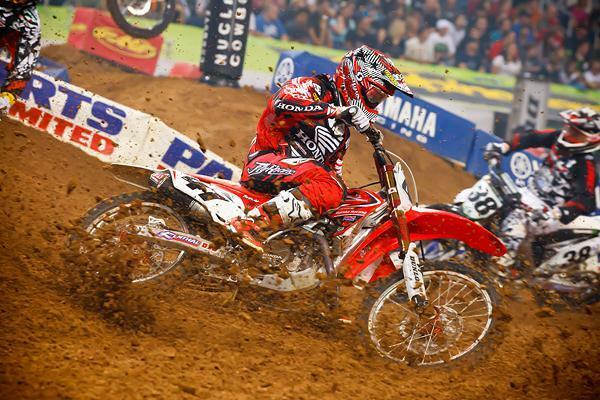 With Canard's injury who will American Honda Racing pick up for the start of outdoors? Trey Canard’s broken femur was the big story coming into the race, as the American Honda Racing rookie was still well within title contention before being knocked out of the series with a crash. Honda Team Manager Erik Kehoe explained that the crash took place at Competitive Edge in Hesperia, California. Late in the day, Canard was scrubbing off of a big drop-down jump, and apparently overjumped the jump and landed hard. Canard still tried to make it to the inside of the next corner, but apparently miscued doing so and went down. No one is sure what caused the break—such as contact with the handlebars or the ground—but the good news is the fracture is non-displaced (not broken all the way through). Canard already has a rod in that femur after surgery from a femur break at Washougal in 2008. The prognosis is six weeks for recovery, but Kehoe notes that it’s pretty hard to make an accurate prediction this early. Canard’s absence leads to a lot of speculation over Honda’s plans for the Lucas Oil Motocross Championship, as both Canard and Josh Grant aren’t scheduled to be back until a few rounds in. Kehoe explained that the team has spoken to both Kevin Windham and Chad Reed, but Windham is not sure if he will race the whole series or not, while Reed obviously would. Kehoe did say the team would be able to house three riders if a replacement started the season, and then Grant and Canard came back. Reed, however, said his TwoTwo Motorsports team is working hard behind the scenes to find additional funding to stay on the road for the summer. 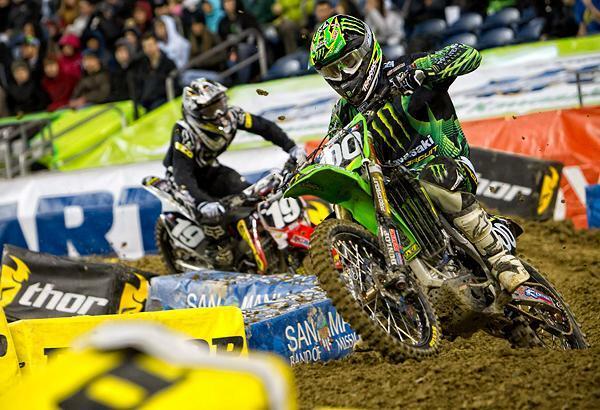 Monster Energy Kawasaki’s Jake Weimer will be in action for the first time at the next race, in Salt Lake City. Weimer hasn’t raced in nearly nine months after injuring his back during last year’s AMA Motocross Championship, and he wants some race time before this year’s motocross tour fires gets underway. That means that the replacement rider, Fabien Iziord, is headed back home to France. In his final race for the team, Iziord finished thirteenth. Hansen reinjured his hand in practice at Seattle. Josh Hansen is making a habit out of riding through pain. After surgery on his broken hand during the break, he crashed in practice and hurt one of his already-injured fingers again. He also tweaked his shoulder, and many wondered if he would even be able to race at all. He did, riding through pain for the third-straight race to take sixth. Luckily, Hansen gets a weekend off this week. With Ian Trettel out, the Rockstar Suzuki team was looking for a replacement rider for AMA Motocross, and rumor has it that Nick Paluzzi, who is currently filling in for Gareth Sweanapol in supercross on the DNA Shred Stix Star Racing Yamaha team, will get the spot. 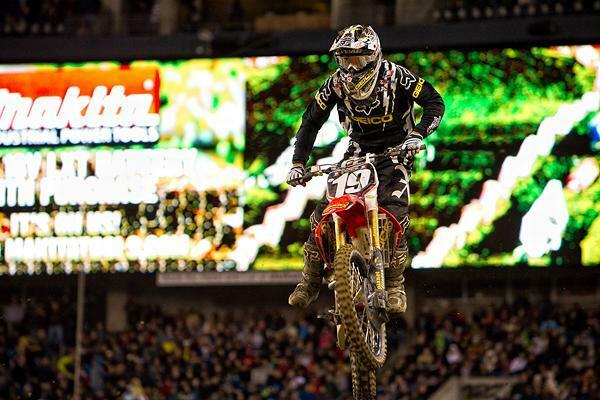 Tomac gained valuable points with a second place finish in Seattle. And the silly season is beginning to heat up. Who will end up where next year? Expect to hear some good gossip by the time the Las Vegas supercross rolls around. Arenacross Champion Tyler Bowers returned to supercross for the first time since 2009. The Monster Energy Babbitt’s Kawasaki rider is receiving some help from factory Monster Energy Kawasaki, including some engine bits. Bowers has also been riding at the Kawasaki supercross test track all year. For the supercross race, he also revised the suspension setup on his bike for supercross. He took 17th in the main event.